Chicago, IL.- Dr. Constantine Papadakis, president of Drexel University in Philadelphia, has been named the recipient of the 2006 Paradigm Award of the PanHellenic Scholarship Foundation, it has been announced by foundation president Chris P. Tomaras. The honor is bestowed annually on a Hellene whose life and career inspire Greek Americans, especially students, to put forward their best effort and to excel so that they may make outstanding contributions to the U.S. as Americans of Hellenic descent. The foundation was founded by Mr. Tomaras who is also Vice President of the Council of Hellenes (ΣAE) / Coordinator for N. & S. America. “Constantine Papadakis represents a bridge between the successful Greek immigrant and the American dream, a link between what is entrepreneurially and academically best in Hellenism and a continuing extraordinary contribution to the American society,” Mr. Tomaras said. Dr. Papadakis will be recognized during a gala dinner on October 14 in Chicago where at least 10 Greek American students will each be granted $10,000 scholarships following a nationwide contest. Last year the recipients of the Paradigm Award were U.S. Senator Paul Sarbanes and U.S. Representative Michael Billirakis, both of whom are retiring from elected public office after long, distinguished careers. Constantine Papadakis, an innovator in higher education with significant experience in both the academic and the corporate world, has been president of Drexel University since 1995. Dr. Papadakis has used the historic strengths of the university (cooperative education, focus on technology and the rich resources of its Philadelphia location) to double Drexelʼs enrollment to 18,500 students. Drexel University is the 20th largest university in the United States, and to date Drexel is the sixth largest private employer in Philadelphia with 5,300 employees and an annual budget of about $600 million. In 1998 Drexel acquired a College of Medicine – the largest private medical school in the nation – a College of Nursing and Health Professions and a School of Public Health which are now fully integrated academic units of the University. Drexel recently launched a new College of Law that focuses on intellectual property, health care and entrepreneurial business. Starting in 1986, Dr. Papadakis became dean of College of Engineering at the University of Cincinnati. Before turning to academia, Dr. Papadakis served as vice president of Tetra Tech, a Honeywell subsidiary, as vice president of STS Consultants and at several engineering positions with Bechtel Power Corporation. Dr. Papadakis now serves on the Board of Directors of Amkor Technology, Inc., Aqua America, Inc., CDI, Inc., Mace Security International, Met-Pro Corporation, Sovereign Bank, Philadelphia Stock Exchange, the Opera Company of Philadelphia, the Greater Philadelphia Chamber of Commerce Executive Committee, the Hellenic College/Holy Cross Board of Trustees and the Judicial Council of the Supreme Court of Pennsylvania. Dr. Papadakis is especially proud of receiving the Justinian Society Award in 2005, being Knighted Cavaliere Ufficiale in the Order of Merit of the Italian Republic in 2004, and receiving the US Department of Treasury Medal of Merit in 2003. In 2001 he received the Golden Medal of Saint Isidore of the island of Chios, the Congressional Medal of Ellis Island, the Medal of the City of Athens, the key to the City of Pireas, the Heart of Philadelphia Award from the American Heart Association and was inducted in the Order of Saint Andrew the Apostle as Archon of the Ecumenical Patriarchate of Constantinople. Dr. Papadakis is a member of Leadership 100 group of supporters of the Orthodox Archdiocese of America. The Gala Dinner will take place Saturday, Oct. 14, at the prestigious University Club of Chicago, 76 E. Monroe Ave. at Michigan, Chicago. The reception will begin at 7 p.m. in the Library Hall and dinner at 8 p.m. in the Cathedral Hall. A lyrical journey with songs by acclaimed Petros Gaitanos is part of the program under the theme, “Land of Sky Blue Sea and Sweetness” (Στη Χώρα της Αρμύρας και του Δυόσμου). To secure tickets to the dinner and the music gala ($125 per person), please call the foundation office, 312-357-6432. Entire tables can also be reserved. 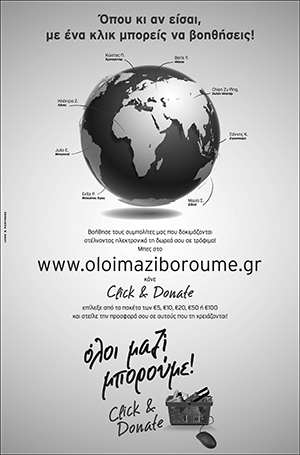 More information available at the foundation website www.panhellenicscholarships.org.